Check out all the shots. 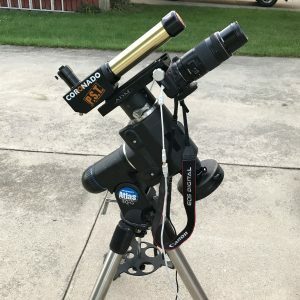 With total solar eclipses so rare in the US, the total eclipse on August 21, 2017 was my very first eclipse. 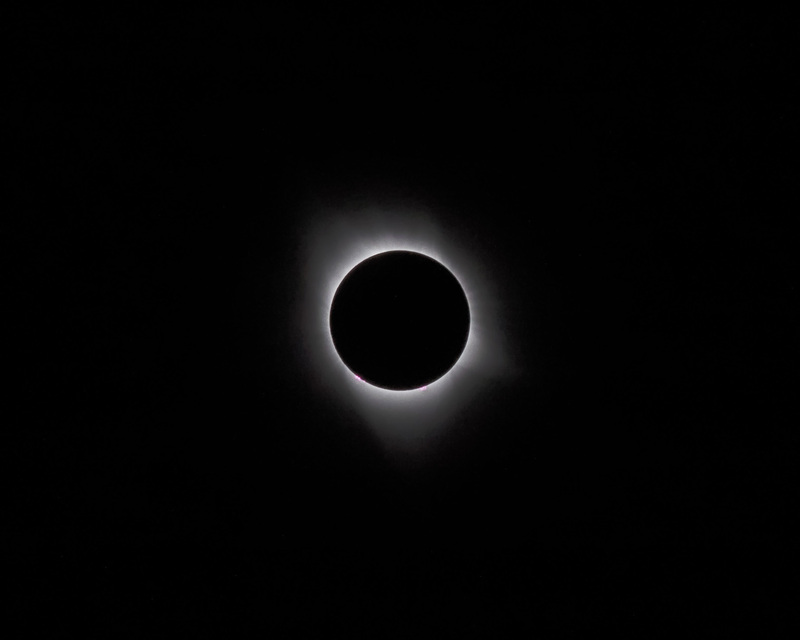 The biggest challenge was to find a place along the path of totality that would be clear for those 2 minutes in the middle of an August afternoon. Thunderstorms were my biggest enemy. I also wanted to both take pictures, but not be bothered with the act of taking pictures. So I needed a fully automated solution. 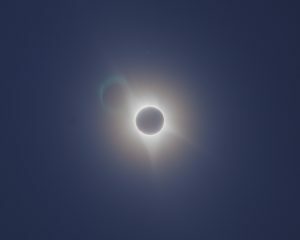 The photography solution was Eclipse Orchestrator. After a little time working with the program I had a script I trusted would take all the pics for me. All I needed was an aimed and focused camera. Aiming was easy, I piggy backed the camera on my Atlas mount which was also carrying my PST. That allowed me to watch partial phases through the PST and take pictures through an ND-100000 filter. Focus was another story. I decided to focus the lens during the previous full moon and mark the lens with a marker. That was a great idea and it worked. On the day of the eclipse I only had to line up the marks and shoot. I started watching the weather months prior so I could get a feel for the forecasts. I’d like to say it helped, but it did not. In the end the forecasts were somewhat in agreement for the 21st. Both Friday night and Saturday morning every forecast agrees that the Nashville TN area was my best bet. Not wanting to be in a big city I selected Clarksville TN. I headed out Saturday morning and arrived in the evening. Walmart was my destination. Along the way my wife found that the the local airport was hosting a free viewing. I decided I’d call in the morning to see how early we could arrive. Sunday morning one more look at the forecast looked positive for Clarksville. A quick call to the airport confirmed the free event and that I could show up Sunday afternoon. My wife and I shopped the local area stores and arrived at the airport for 3:00. We got settled in and I quickly set up my mount and did a rough polar alignment. I confirmed I was tracking the sun just fine. All was ready for Monday. Monday morning one last peek at the forecast indicated I was in the right place. We got set up in the cool of the morning and sat in the shade once it got hot and it did get hot. Clouds could be seen around on the horizon, but they never got close. First contact came right on time. 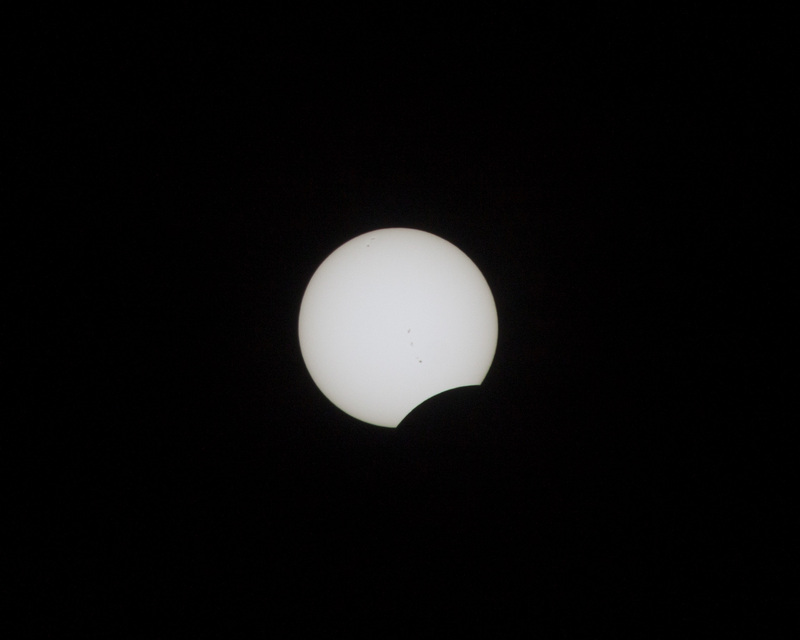 As the moon slowly covered the sun not much seemed to change until about 95%. At that point I noticed it was not as oppressively hot and it started to look a bit darker. With no trees in the area I simulated the pinhole cameras that leaves make with my hands and was rewarded with a bunch of crescents. With 5 minutes before totality I switched the computer program driving the camera and adjusted from 300MM to 135MM. As totality arrived I started a video of us watching it and we spent the next 2 minutes and 30 seconds just looking up. It was amazing! That view made the whole trip worth in many times over. After totality I switched back to the partial phase photography and got some better “sliver photos.” We were packed up by the time it was over and on the road. The return trip took two days due to traffic. What a mess! But we had a blast. I’d do it again in a heartbeat. The next total eclipse comes right through my yard. Maybe I can stay home in 2024.